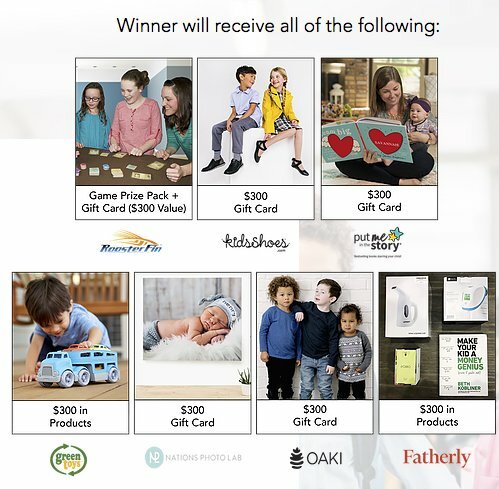 Grand Prize: A $300.00 Worth of Products from Fatherly, $300.00 Green Toys Gift Card, $300.00 kidsshoes.com Gift Card, $300.00 Nations Photo Lab Gift Card, $300.00 Oakiwear Gift Card, $300.00 Put Me In The Story Gift Card, Game Prize Pack & Roosterfin Gift Card. Enter now. $300 Worth of Products from Fatherly, $300 Green Toys Gift Card, $300 kidsshoes.com Gift Card, $300 Nations Photo Lab Gift Card, $300 Oakiwear Gift Card, $300 Put Me In The Story Gift Card, Game Prize Pack & Roosterfin Gift Card.